Besides technology considerations, any initiative must include a cultural shift by both providers and patients. Proactively addressing public health is the driving force behind population health management. More than simply delivering better care, today's providers are looking for ways to reduce the need for reactive interventions such as emergency department visits, hospitalizations, and readmissions, which often address undetected—and therefore untreated—medical issues that can significantly drive up the cost of health care. It's a noble goal, but is it realistic? How can health care organizations reach such heights without busting their budgets? There are many facets to population health management. Technological barriers need to be overcome and costs must be taken into account. Perhaps the biggest challenge, however, lies in changing the way people think about health care. "It's not episodic. It's trying to take a more broad view and get beyond a single episode of care," says Ty Tolbert, vice president of solutions for Wellcentive, a provider of tools and services that support population health management. "It's a methodology." Tolbert says the most basic components of the methodology are data. Health care organizations must have the ability to collect, aggregate, and analyze data. Rather than the retrospective data that traditional health care relies on to guide clinical episodes, population health management attempts to determine which patients can benefit from preventive interventions to potentially avoid a clinical episode. These initiatives can take the form of national programs, such as the physician quality reporting system (PQRS), regional programs, programs run by insurance companies, or programs developed by the providers themselves. The first step toward any type of population health initiative is to understand the types of data necessary to meet the organization's needs, Tolbert says. He adds that organizations often think they need as much data as they can collect, but that's not necessarily true. For example, PQRS requires data from minimal sources. Also, with data often stored in multiple EHR systems, it's important for organizations to know what types of data are standardized across multiple systems. "In a primary care multispecialty group practice, you need to be able to see the medical record to know what's happened to that patient, not just what happens specifically inside of the ambulatory care environment that you as a practitioner manage, but what happens outside of your environment," says Bob Dichter, a senior director of project management for NextGen Healthcare, an EHR provider. "What happens with the patient in their home? What happens to the patient with their specialist? What happens to the patient in the hospital? The groundwork is whether you are able to access your data from multiple sources." Connecting the wires between multiple care providers, which is only part of the equation, is no easy task. Once the data are aggregated, they need to be analyzed. Dichter says analytical tools can help providers better understand how their services are being utilized and identify gaps in care to locate at-risk patients. Analytical tools also help to identify the types of data that must be reported for population health management programs. Evaluating the data requirements for various programs can be daunting. Tolbert says regional programs may be easier to participate in than PQRS and may provide financial incentives for participation. However, there is a good deal of variability among regions. He recommends that health care organizations do their homework to find out what's available and begin their data collection process with a question: What outcome are we trying to achieve? For example, the organization may want to target its efforts toward patients who are the most likely to be readmitted. A targeted approach allows health care providers to determine their priorities and use their resources more efficiently, Tolbert says. Many programs use benchmarks related to common conditions, such as diabetes and heart disease, to measure participants' effectiveness in meeting population health goals. 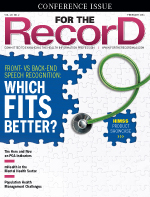 To track benchmark data, many EHR software providers have developed a registry function that allows health care providers to measure their performance against national standards. Registries are a vital part of population health efforts, says David B. Nash, MD, MBA, the founding dean of the Jefferson College of Population Health and the Dr. Raymond C. and Doris N. Grandon Professor of Health Policy at Thomas Jefferson University. HIM and other medical records professionals are likely to play a key role in registry management, Nash says. "These registries are going to be the heart and soul of population health delivery, and someone is going to have to manage these registries," he notes. "The doctors will be the utilizers, but I envision that [HIM and medical records professionals] will be very involved in a deeper understanding of the registry function." Upgrading technology, such as implementing EHRs and developing interfaces among multiple systems, typically requires a significant up-front investment. Hiring the necessary additional staff and changing business processes are part of that cost. Looking at the long-term picture, however, technology upgrades could very well save money. In fact, Dichter says many health care providers include time saved as part of their value calculations, noting that improved methodology—in the coding department, for example—can boost workflow and improve the quality of care. Tolbert adds that once data are aggregated, it's fairly simple to calculate a return on investment on various population health initiatives. He says, generally speaking, costs are minimal compared with benefits. For example, an organization that Wellcentive worked with saved $8 million in PQRS penalties and earned an additional $8 million in incentive payments from a Blue Cross Blue Shield pay-for-performance program. Besides generating revenue now, Tolbert says implementing a population health initiative can stave off future penalties. "With a lot of these initiatives, most of them only have the upside available. In other words, you're only going to be able to make money or maybe a smaller amount if you don't do as well, but you're not really getting hit with huge penalties across all of these programs, except with PQRS," he says. "But if you look two, three, four years out, you're going to start to see more of the downside, and that's where it's going to get very interesting in analyzing the financial risk of not making moves into population health." Moving into population health requires organizations to reexamine how they deliver care, a difficult but necessary process. Dichter says nearly all medical contracting is shifting to a paradigm focused on quality and value. As a result, providers must demonstrate they're working in that direction, a strategy that will pay off in the long run. "The organizations that I have worked with over the past several years who have been the most successful in taking on risk have decided to change how they practice medicine," Dichter says. "One of the organizations that I worked with about a year ago was working with a managed care company through an ACO [accountable care organization] agreement. They identified a number of patients who had a fall risk, and they went to these patients' homes and installed ramps. No one was reimbursing them for this. This was 100% out of their pocket. And the reason they did it was because they realized that the cost of installing the ramps was significantly less than the costs they would incur for hospital admissions and treatment of broken hips." Interventions as simple as administering flu shots to at-risk patients and treating diabetic patients whose A1c levels are out of range can benefit both patients and providers. Dichter, who says uncontrolled symptoms account for some of the highest health care costs, believes connecting with at-risk patients is a significant opportunity to save lives and money. Data sharing plays a pivotal role in population health efforts. Although some government regulations mandate sharing and parts of the country have high levels of data exchange, not everyone is on board. While large multisite organizations regularly exchange data with other providers, small organizations in competitive markets may be reluctant to share patient information that they view as proprietary. Dichter says in some cases corporate philosophies work against effective health data sharing, adding that decision makers must recognize that health care delivery has changed in the past 20 years. In today's environment, patients are routinely referred to out-of-network providers. Patient collaboration also is becoming more integral to health care delivery. Rather than simply dictating prescriptions and dispensing medical advice, clinicians must now build a relationship that will help patients make informed decisions about their own care. To effectively improve population health, a culture change is needed, says Ellen Donahue-Dalton, chief marketing officer of Medecision, a provider of population health management tools. "The health care system tends to look at things from an inside-out standpoint," she says. "The idea of switching the dynamic and thinking about consumers as an informed and engaged part of the process is a little foreign to a lot of care delivery organizations. Typically, they think about patients or consumers coming to them when they are ill and need care. [The providers] fix the problem, the patients go on their way, and everybody's better." Donahue-Dalton says consumers, who tend to think this way as well, must be educated to change their longstanding perceptions. One goal of population health is to encourage patients to participate in their care, but getting their attention can be a challenge. Donahue-Dalton says it won't be a quick or easy process to convince people to change their behaviors and take steps to remain healthy, but it can be done. One leverage point will be financial: As consumers assume more financial accountability for their care, they will ask more questions and demand more transparency. They also may begin to think more about how their health choices have consequences, she says. Perhaps the biggest leverage point, however, is social pressure. Preacute reminders, such as alerting diabetic patients when their A1c levels are out of range, and postacute reminders about medication compliance and follow-up visits can be effective, Donahue-Dalton says. However, including family members or close friends in the process can enhance their effectiveness. Donahue-Dalton says community networks, or care circles, comprised of people selected by the patient can help keep at-risk populations on track with their health regimens. "I think we have the technology tools in place. The key is putting them together in an arrangement where the right incentives and information are shared. That is where [population health] will become interesting," she says. "The first generation is just smartphone app registration, secure messaging, and being able to view a patient's clinical timeline via smartphone. It's all current technology. The challenge is to develop an ecosystem that allows this information to be used effectively." The ecosystem must encompass patients and providers across the entire continuum of care. If population health initiatives are to have a significant impact on public health, getting the right information at the right time to the right people throughout the chain of care will be essential, Nash says. With patients being tracked in hospitals, wellness centers, rehab centers, ambulatory surgical centers, nursing homes, and at home, it will be a drastic change in how consumers view health care delivery. "There will be a greater interest and concern in the broad spectrum of where care is delivered, most especially outside the four walls of the hospital," Nash says. "Population health is going to be a real challenge in coordinating the information across diverse care settings because population health, among other things, is going to emphasize the move from inpatient to outpatient, from acute care to prevention and wellness, and from volume to value. People will be pushed out of their comfort zones into aspects of the delivery system where they really have not played a prominent role." As the emphasis on the change in delivery of care escalates from volume- to value-based care, population health management initiatives are becoming more prevalent across the health care industry. However, many organizations are addressing their initial population health needs without a population health vendor-provided IT solution. A recent survey, available at himss.org/News/NewsDetail.aspx?ItemNumber=46055, offers insight from nearly 200 health care executives (C-suite, administrators, directors, and vice presidents) on their population health initiatives, and their current and future approach to population health IT solutions and consultants. "While roughly 67% of surveyed organizations claim to have population health programs in place," says HIMSS Analytics Director of Research Brendan FitzGerald, "only one-quarter of those currently utilize a vendor-provided solution to address their population health needs." • Roughly 11% of study respondents with initiatives in place currently use a consultant for their population health strategy. • More than one-half of study respondents without current population health initiatives in place plan to employ initiatives in the future. • More than one-third of organizations with plans to employ population health initiatives in the future plan to use a consultant or would consider it.